Veteran space journalist digs into the science and technology--past, present, and future--central to our explorations of Earth's only satellite, the space destination most hotly pursued today. In these rich pages, veteran science journalist Leonard David explores the moon in all its facets, from ancient myth to future "Moon Village" plans. 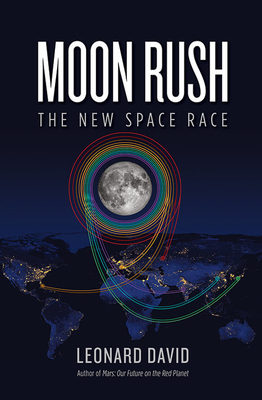 Illustrating his text with maps, graphics, and photographs, David offers inside information about how the United States, allies and competitors, as well as key private corporations like Moon Express and Jeff Bezos's Blue Origin, plan to reach, inhabit, and even harvest the moon in the decades to come. Spurred on by the Google Lunar XPRIZE--$20 million for the first to get to the moon and send images home--the 21st-century space race back to the moon has become more urgent, and more timely, than ever. Accounts of these new strategies are set against past efforts, including stories never before told about the Apollo missions and Cold War plans for military surveillance and missile launches from the moon. Timely and fascinating, this book sheds new light on our constant lunar companion, offering reasons to gaze up and see it in a different way than ever before. LEONARD DAVID has been reporting on space science and exploration for more than 50 years. His writing has appeared in the Financial Times, Foreign Policy, Private Air, Sky and Telescope, Astronomy, and Aerospace America. David has been a consultant to NASA, other government agencies, and the aerospace industry and currently serves as SPACE.com's Space Insider columnist. He is the author of Mars: Our Future on the Red Planet and co-author of Buzz Aldrin's Mission to Mars.